Self-service business intelligence is the holy grail for many data-driven enterprises. But answering ad hoc questions usually involves a manual and time consuming process, even with visual discovery tools. Advances in AI and machine learning now make gaining insights far easier for business users and more accessible to a wider range of users. 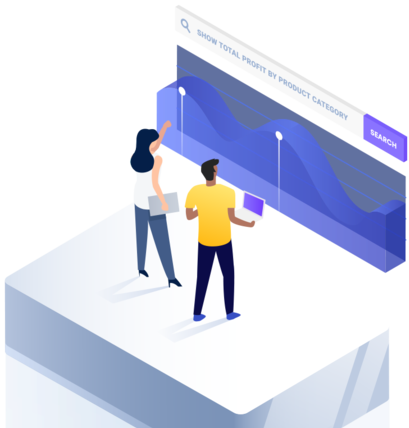 Watch this 45-minute webinar to learn how AI will fulfill the promise of self-service analytics by improving how users explore data using natural language query and instantly discover answers with embedded machine learning. Self-service business intelligence is the holy grail for many data-driven enterprises. Learn how advances in AI and machine learning now make gaining insights far easier for business users, making analytics more accessible to a wider range of users. Head of data science at Tellius, Jason holds a PhD in particle physics, but his true passion is machine learning, distributed computing, and data analysis. Head of Marketing at Tellius, Alvin has over 15 years of BI and SaaS application experience, and is dedicated to making complex data problems simpler for everyday business users. Head of marketing at Tellius, Alvin has over 15 years experience in BI and SaaS applications, and is dedicated to making complex data problems simpler for business users.